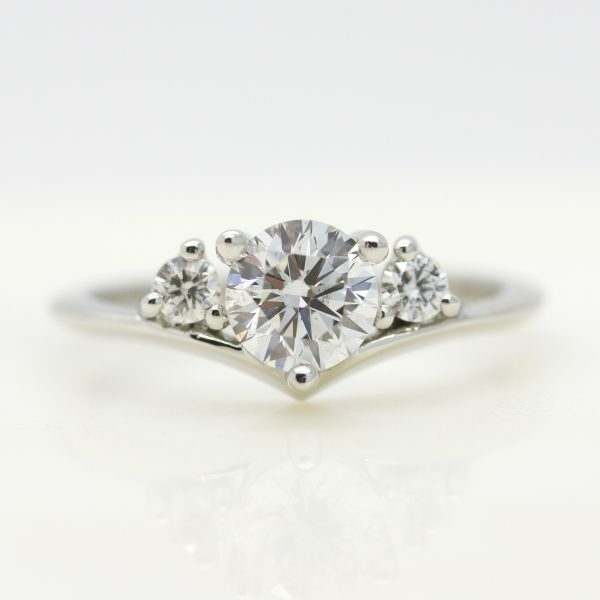 A trilogy engagement ring, crafted especially for you. 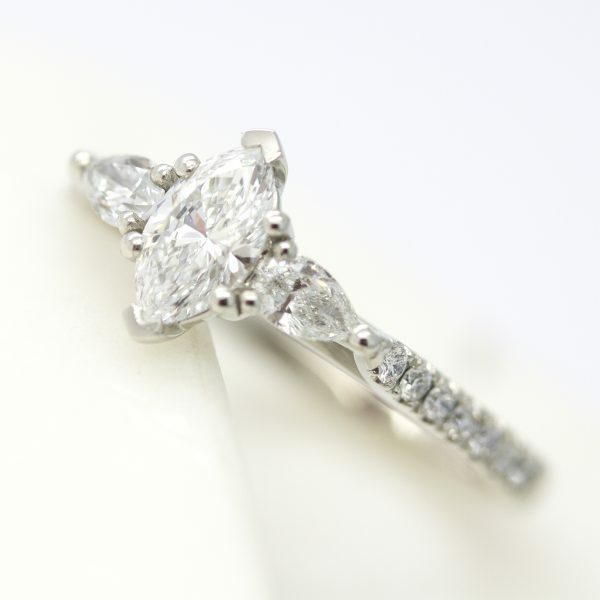 Trilogy engagement rings are often also known as trinity engagement rings and three stone engagement rings. 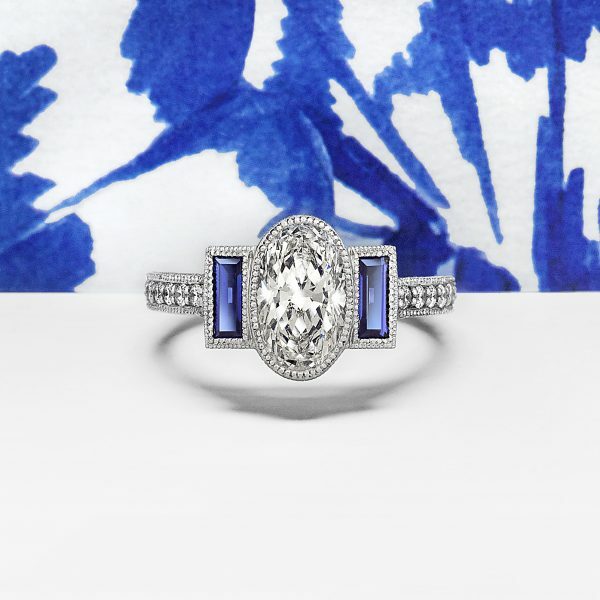 A sentimental and classic engagement ring style, three stone engagement rings feature just that–three gemstones or diamonds, each one symbolizing the past, present and future. 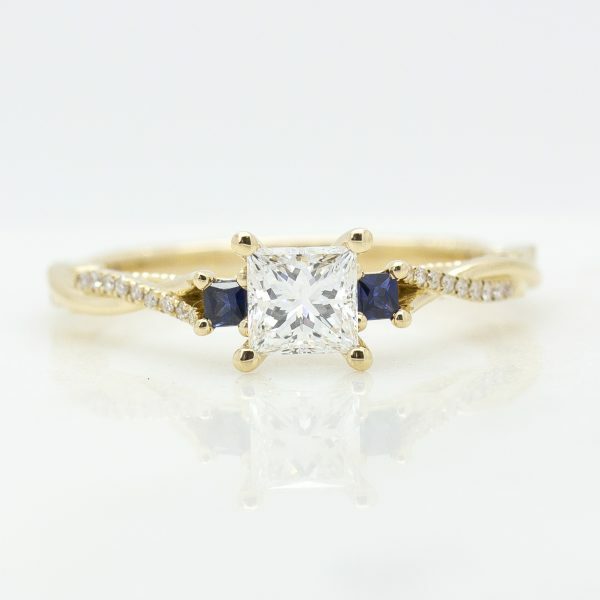 Trilogy engagement rings look spectacular set on both gold and platinum bands and offer the perfect opportunity to combine coloured gemstones with diamonds for a unique engagement ring design. 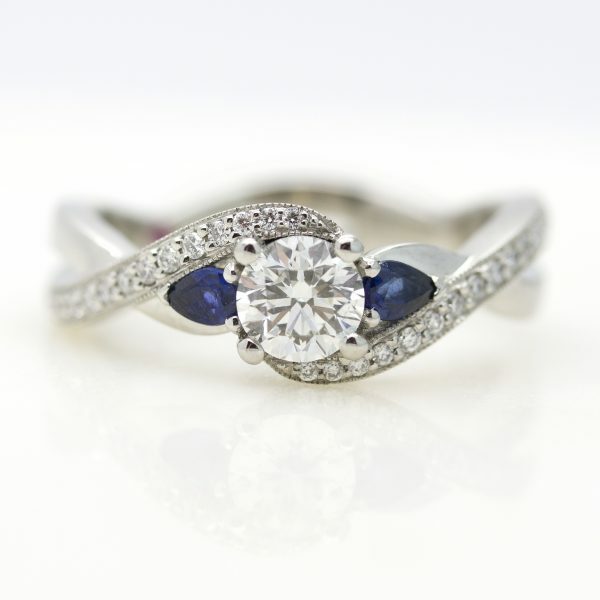 Be inspired by our trilogy engagement rings, individually designed with love by you and crafted by us. 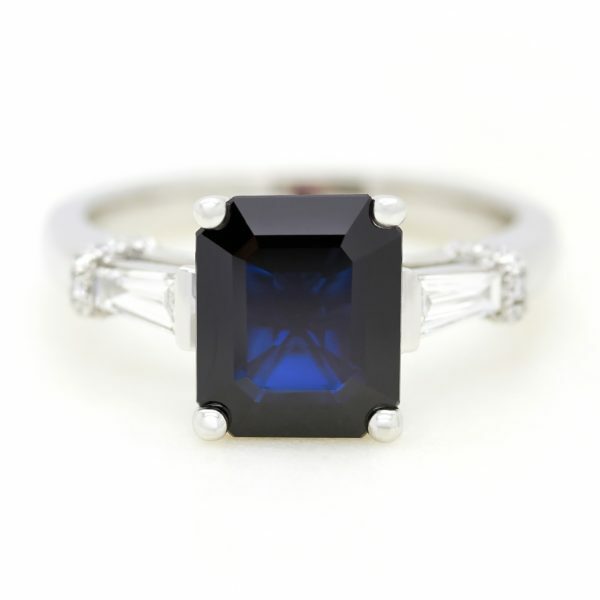 What is a trilogy engagement ring? 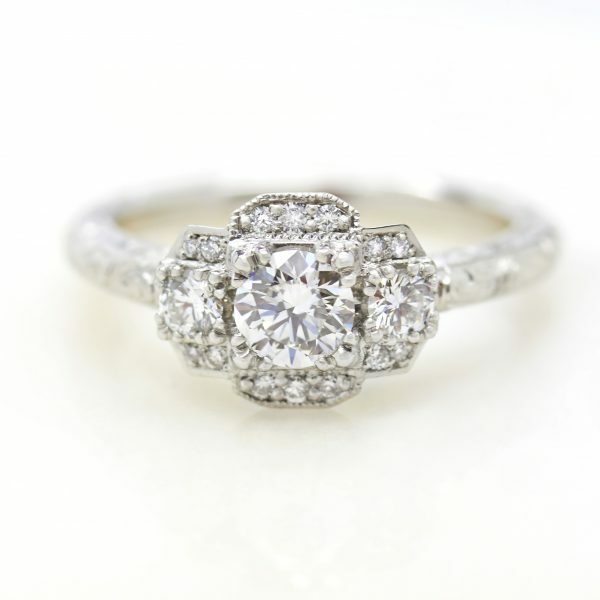 What does a trilogy engagement ring symbolise? 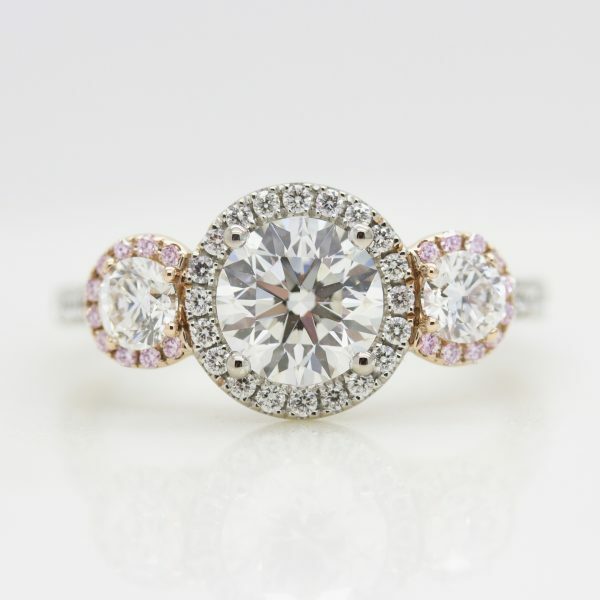 What ways can a trilogy engagement ring be designed? Which celebrities wear trilogy engagement rings? 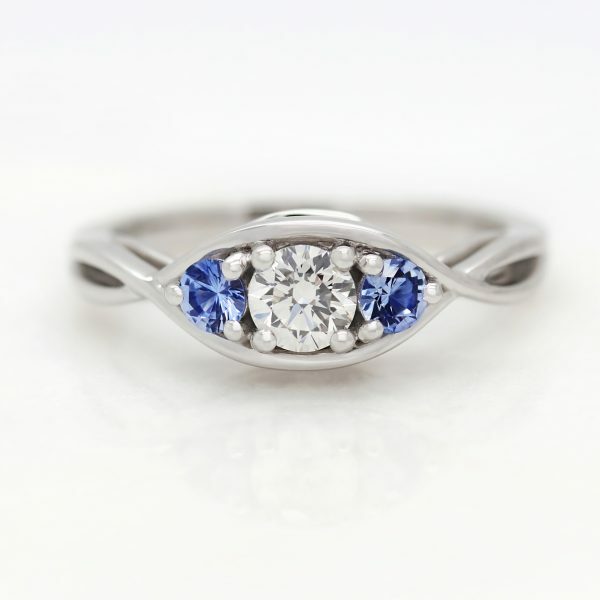 A trilogy engagement ring, or sometimes called a three-stone engagement ring, or trinity engagement ring, is simply a design style that features three diamonds or gemstones as its centre. 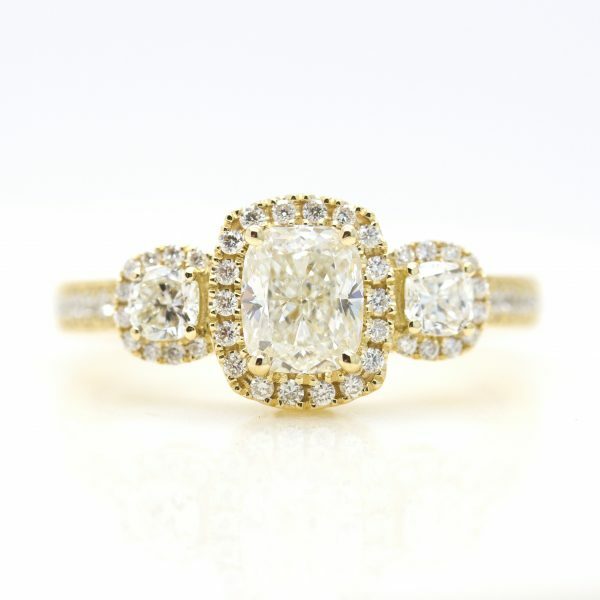 Whatever you call them, a trilogy engagement ring is a sentimental and classic engagement ring style. Trilogy engagement rings feature three centre gemstones or diamonds, each of the three stones singularly symbolising your past, present and future together as a couple. 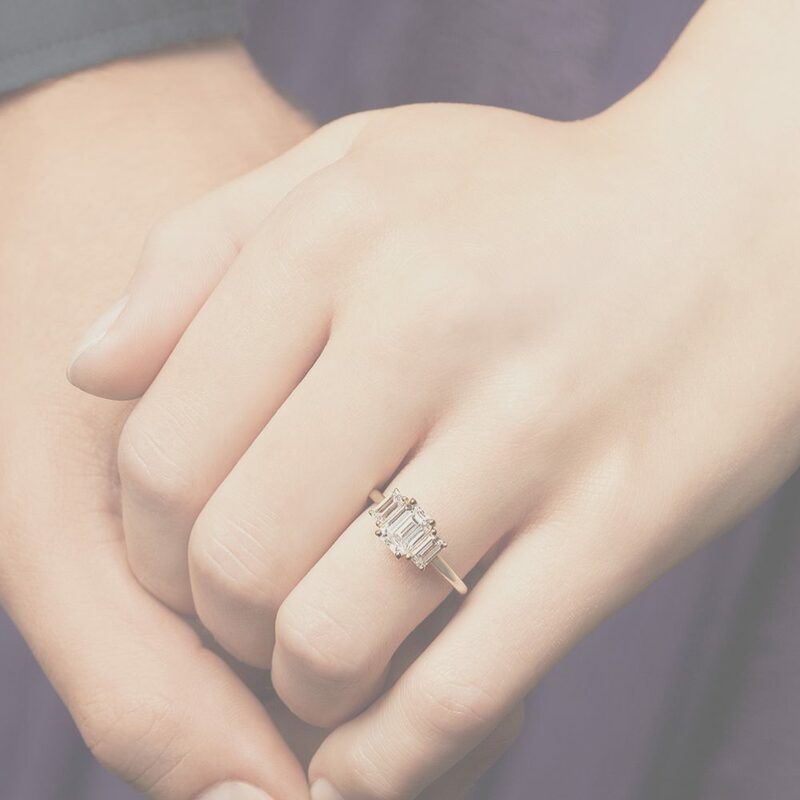 With each stone representing a significant phase of a love story, three stone engagement rings are a romantic and symbolic choice. 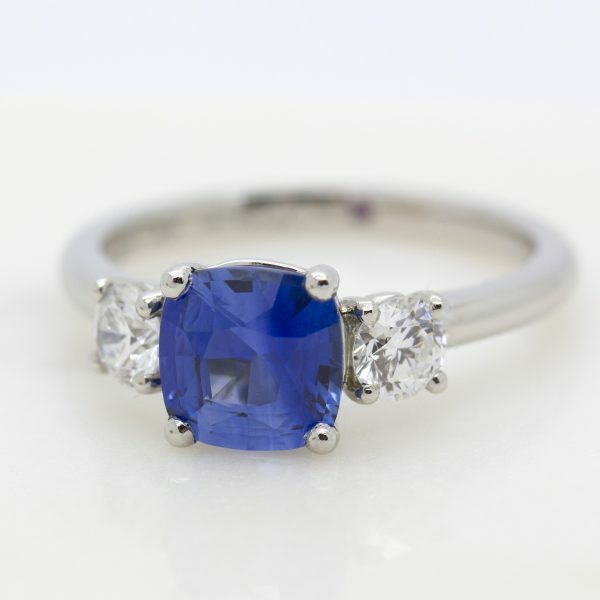 For a truly custom engagement ring, the trilogy is a flexible style that works well with different coloured gemstones, shapes and orientations. 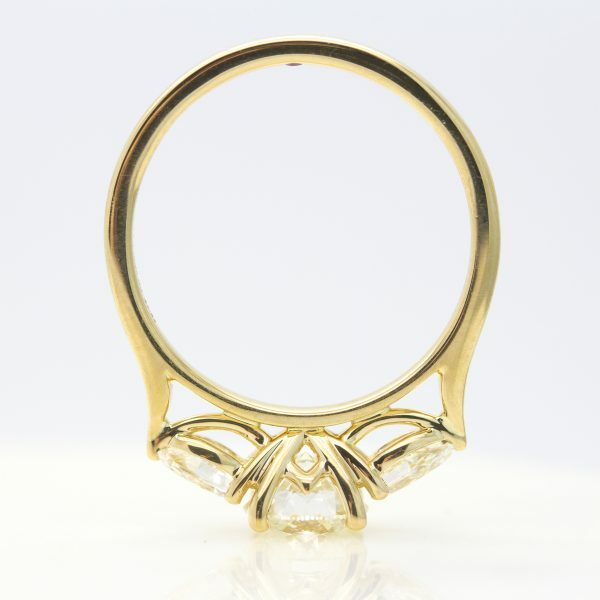 Generally speaking, the centre stone of a trilogy ring will be larger, or set slightly higher than the flanking stones, to signify the importance of the ‘present’. 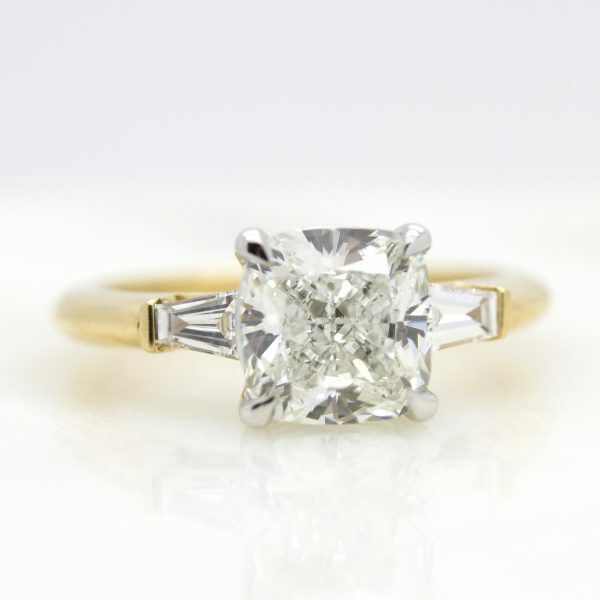 The sizes of the flanking stones are typically cut to around one third of the centre stone size, but can be increased or decreased to accentuate the prominence of your chosen centre stone and give a fuller coverage of the finger. 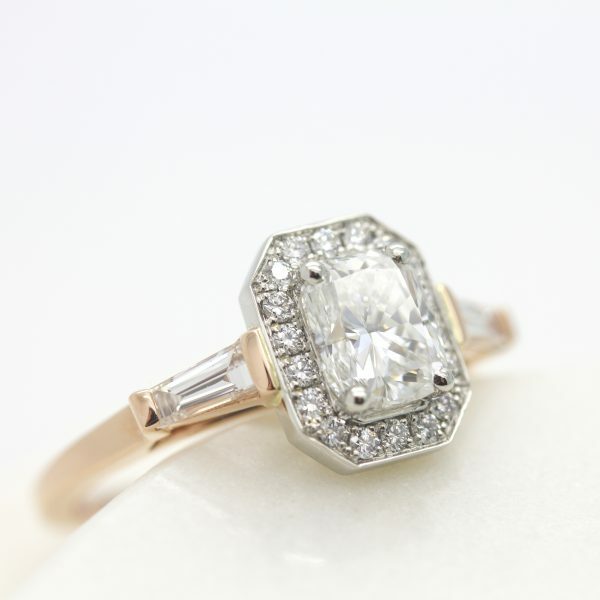 Stone combinations that are often seen include, three rounds, one round with two flanking pear shapes or any shape centre with interesting fancy diamond cuts to flank either side. 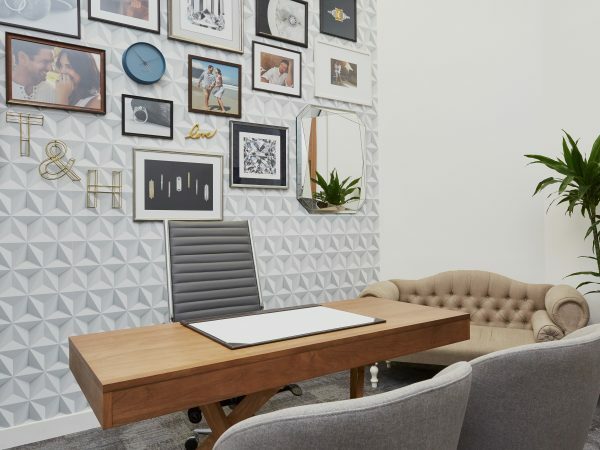 These can be trapezoids, trilliant cuts, baguettes, tapered baguettes or bullets. 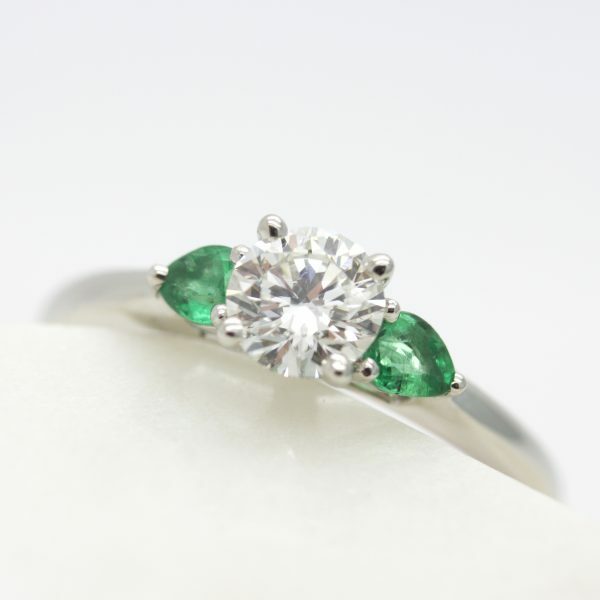 Three round diamonds is a very traditional configuration, whereas three emerald cuts stones is a combination associated more with the Art Deco era. 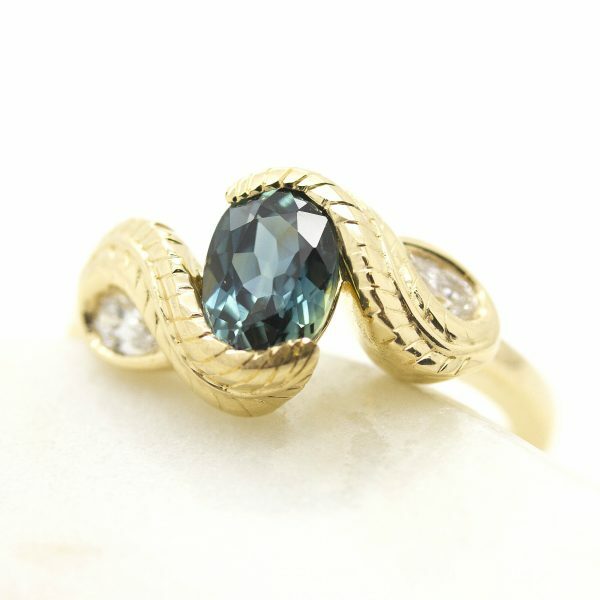 This will be reinforced by your choice of setting style – traditional rings are often set with claws, while swirl or rub-over settings can create a more contemporary look. 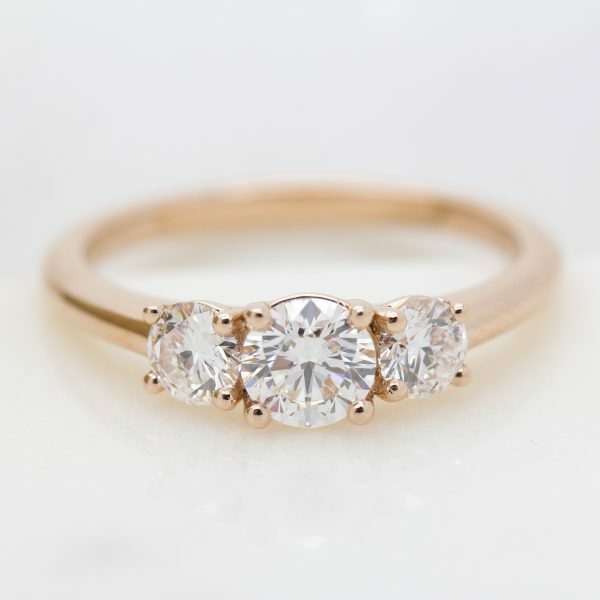 The great thing about the trilogy engagement ring style is that it can remain more traditional and classic, or push design boundaries with a more contemporary choice of styles and materials. 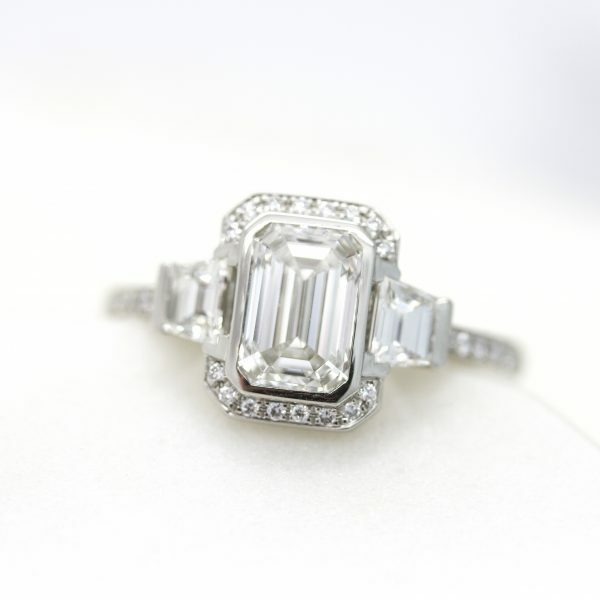 Following in the steps of contemporary trends, Meghan Markle, Ciara and Miranda Kerr wear engagement rings that feature a large centre diamond with interesting cut accent diamonds, that flank either side. 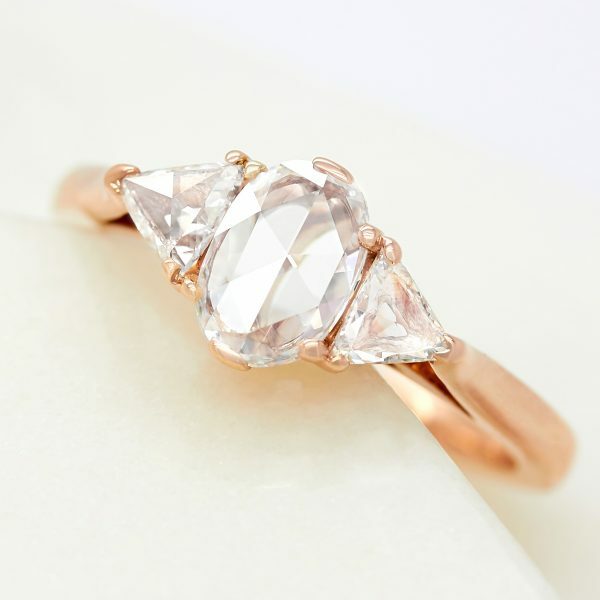 Meghan Markle’s trilogy engagement ring features an elongated cushion cut centre diamond, sourced in Botswana by Prince Harry, and is flanked on either side with two round diamonds from his mother’s personal collection. 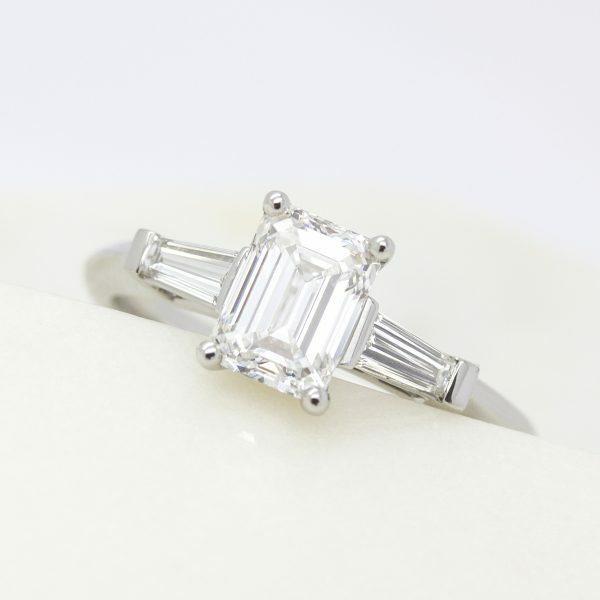 Ciara’s centre cushion cut diamond is surrounded by two brilliant cut diamond trapezoids, while Kerr has tapered baguettes either side of her 3-4 carat round diamond. 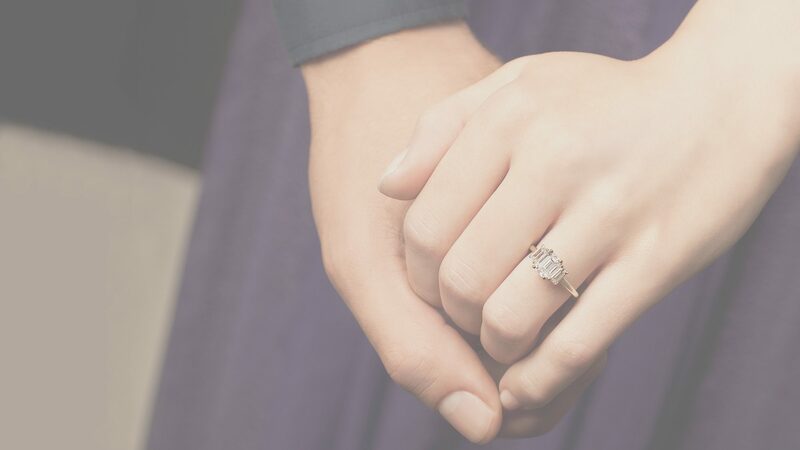 The concept of a ring that symbolises past, present, and future has become an engagement ring tradition that will likely continue for generations to come.